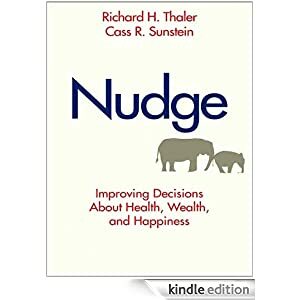 Ian Stewart’s (Delloite) excellent Monday Morning Briefing last week brought to me “Nudge”, a book written by US economists Cass Sunstein and Richard Thaler as a guide to applying behavioural economics to policy problems. I have to admit that I was more inerested in the applicaiton of “nudges” to everyday life scenarios – from taking the peanuts bawl away to stop you from going on until you ate them all, to “positioning” apple slices and book activities at eye level in my kitchen instead of the unhealthy and less educational alternatives that a child passing though can choose to engage with. But also the possibilities in my work, in education. I work for a “new” British university which prides itself on widening participation for non-traditional entrants to higher education (largely those turned away by “red brick” institutions). A problem that has become more acutely noticeable in the economic downturn of late is that despite all efforts of academics to deliver an outstanding provision, our students do not fair as well in the post-education employment stakes. I believe part of the problem is that our students (not all of them of course, but a large proportion) lack the social capital to support them in making wise choices and developing strategies about entering employment (for e.g. a large number of students are first generation university attendees, whose parents are perhaps less well equipped to steer in the right direction at the right time; a large proportion of our students never find the need to visit the Careers office or do so only in their final year when it is arguably a bit late; don’t look for relevant summer time or part time work while at university which can only make their CV more attractive at the point of applying for graduate positions, not to mention the possibility of being offered a graduate position upon graduation by the company where one completed a work placement, internship or a voluntary engagement. This is a huge canvas for nudging as far as I am concerned. To encourage my students to start the process of thinking about “getting a job” strategy I have tried to incorporate in my assessment strategy a series of tasks which reward students with 1 mark towards their final grade if completed (a method that two colleagues of mine – Richard Jones and Toby York had successfully implemented prior to that with the aim of increasing engagement with the subjects they teach). My tasks are “employability” oriented – defining career aspirations and objectives, doign a job search, putting together a CV in response to an advertisement of interest, skills gap analysis, answering mock interview questions. Students choose whether to “bother” to complete these tasks worth 1 mark only. A very large number of them do. So I believe I am making some difference in starting their thought process about future employment early enough which should benefit them in the long run. Where I fall short is in my inability to provide them with feedback on the quality and content of their task submissions due to resource constraints (me versus 250 students). So I know that largely they are doing it (the nudge works), but I don’t know how well. Yet. This project is a work in progress. What I dream of having the authority to do is make work placements, internships or voluntary work a compulsory element of our university’s degrees. At the moment that is an option and very few students take that up, the majority in effect forfeiting a potentially valuable experience and opportunity. Is having the work based element as a default in the degree too wild a nudge? My son was born and is growing up not in the country where I did those same things – Bulgaria. I would very much like him to have appreciation of his heritage, speak the language, respect the traditions, and quite frankly – feel Bulgarian alongside feeling British and as part of feeling European. I struggle to think of effective nudges in that direction other than signing him up for Bulgarian School at the Embassy which he attends for a couple of hours a week and treats as play group for the time being. Once the “play group” effect is over – I can’t think of much that would incentivise him to continue with studying what he would have otherwise been immersed in had we lived in Sofia instead of London. I certainly don’t want to force anything as that will build resentment. So this “not pushy” mu really wants to push. But how. Any suggestions?